The Florence Wild Rivers Interpretive Center is located within the Florence Natural Resources Center Building at the corner of US 2 and Highway 70/101 in Florence, WI. It is the source for tourist and visitor information relative to all of Florence County. The building also contains offices for the USDA Forest Service, the Wisconsin DNR, the University of Wisconsin Extension and the Florence County Forestry and Parks Department. 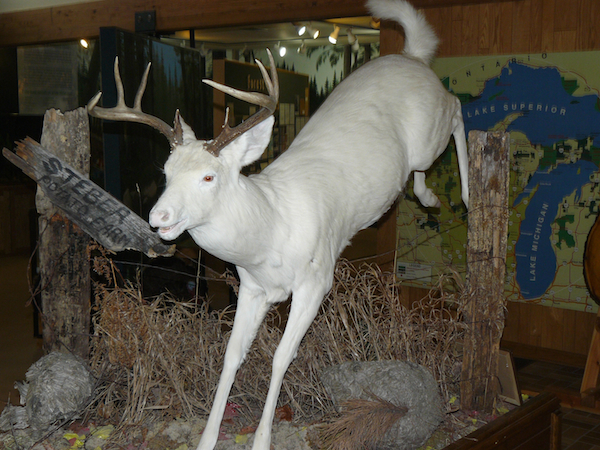 Learn the story behind this beautiful Albino Whitetail deer mount. He once roamed the woods of Florence County. He is breathtakingly beautiful.